I made 6 flavors of homemade ice cream for my Mad Hatter’s Tea Party this weekend – if I can get myself together I’ll post more pictures of the food and the recipes shortly. But I had a request for this recipe when I came in to work today, so I’m getting this up on my lunch break. Enjoy! I’ve made this every summer for 3 years now – the first time, I used green tea drink mix instead of matcha powder and just added extra. The color was much lighter and the flavor milder – using the real stuff is better, even if it’s kind of hard to find. The jar I got was probably enough for 3-4 batches of ice cream. The recipe makes about 1.5 quarts, I think – I keep forgetting to measure the finished product because we’re in a hurry to get it into the freezer. In a small saucepan, combine sugar and water. Cook and stir over low heat, just to melt the sugar and turn into a syrup – about 5 minutes (If you have a candy thermometer and want to be very precise, check if it reaches 230°). Add the mirin, stir thoroughly, and remove from heat. 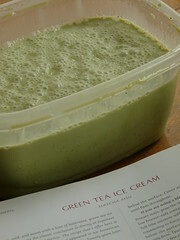 In a small bowl, combine 1/4 cup of the warm syrup with the matcha and stir until dissolved. Return concentrate to saucepan and stir until completely blended. Set aside to cool. When you are ready to make the ice cream, stir in milk and half & half and mix thoroughly. If the syrup starts to crystallize, don’t reheat it – it will spoil the color. Just put everything in a blender and whip it up to dissolve the sugar again. Pour into ice cream maker and freeze thoroughly.